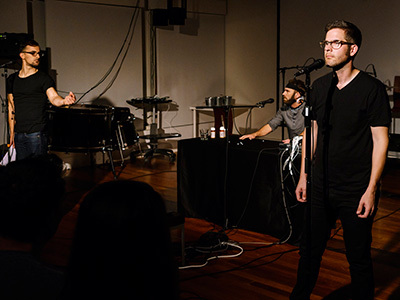 line upon line members Matthew Teodori, Cullen Faulk and Adam Bedell performing Charlie Sdraulig’s many translations at Center for Computer Research in Music and Acoustics at Stanford University, May 2017. Photo by Andrew Watts. Less than a century has gone by since a composer first had the brainstorm of creating a piece solely for percussion. Thanks to groups like Austin’s line upon line, which have helped midwife new works ever since, a few ear-opening pieces have become musical landmarks. And line upon line has some in store. The trio devotes its next Austin program to John Cage, the cheerful iconoclast whose innovations made him an icon himself. The concerts, Nov. 30-Dec. 2, will start with the exuberant clangor of First Construction (In Metal), a 1939 work that marshals sonic artillery from gongs and bells to auto brake drums and a souped-up piano. First Construction is “not just Cage’s first masterpiece, but I think it’s also one of the first great pieces for percussion, period,” line upon line’s Matthew Teodori said recently. “He was finding all these new sounds and organizing them.” But what about the noise of crumpling paper… will reveal Cage’s more-delicate side. 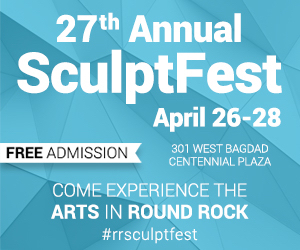 Austin’s Rude Mechanicals theater troupe will join in for The City Wears a Slouch Hat, a 1942 radio play that pairs a script by experimental poet Kenneth Patchen with a Cage score. Matthew Teodori, Cullen Faulk and Adam Bedell performing Chris Lortie’s Pharmakon at Center for Computer Research in Music and Acoustics at Stanford University, May 2017. Photo by Andrew Watts. Teodori hailed Cage as one of “our patron saints,” then named another: minimalism pioneer Steve Reich. 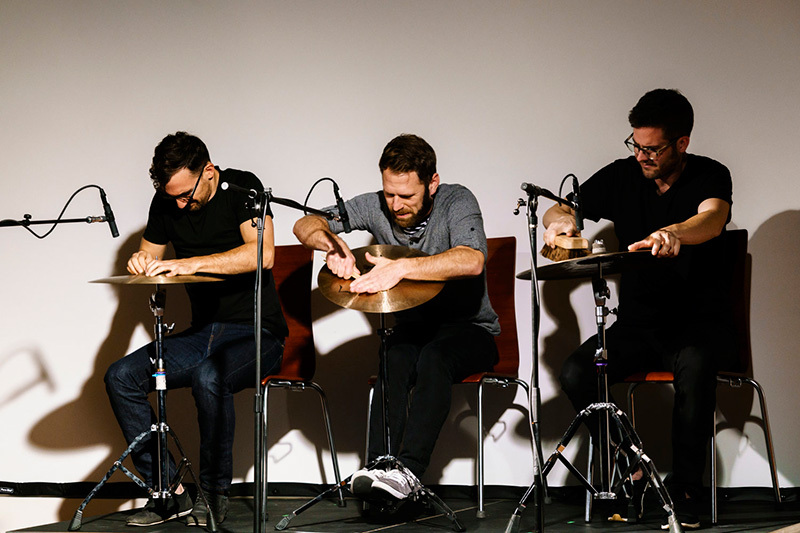 Bringing along nine fellow musicians, line upon line will come to Houston’s Menil Collection on Jan. 17 to perform Reich’s Drumming. Beginning merely with bongos, Drumming marshals voices, piccolo and an array of percussion to create a stream of sound that ripples without break for an hour or more. Teodori and his line upon line collaborators, Adam Bedell and Cullen Faulk, also have today’s composers on their agenda. April 5-7, they’ll host German-British composer Claudia Molitor, whose 2016 work Entangled had a “score” that consisted of ropes: Knots tied into them told Teodori and company what to do musically. 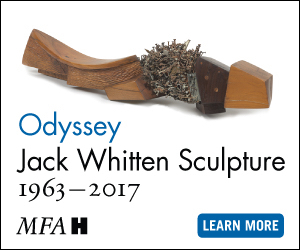 Molitor’s new work, Decay, will explore the mix of decline and transformation that decay, in biological or other forms, can bring. The full-evening creation will “embrace the melancholy of loss and rejoice in the prospect of change,” her description says. 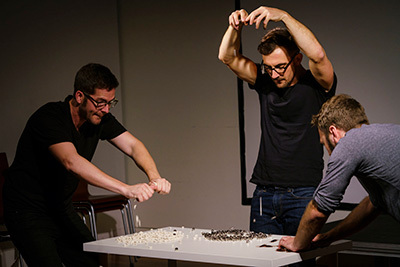 Adam Bedell, Matthew Teodori and Cullen Faulk performing Constantin Basica’s Fugue for Bells, Beans and Bugs at Center for Computer Research in Music and Acoustics at Stanford University, May 2017. Photo by Andrew Watts. Combining music, video and recorded sound, Decay will premiere in a nascent form at a British festival this month. Over the next year, Molitor will visit cities on both sides of the Atlantic Ocean—with Austin as the only U.S. stop—performing the work with local groups, which will add their own contributions in collaboration with her. Molitor will perform the transformed work, melding all the additions, at next year’s festival. Teodori was also looking forward to an imminent Austin visit from Costa Rica native Mauricio Pauly, who will return to premiere his Fream ad wall in line upon line’s season finale, May 31-June 2. The purpose of Pauly’s initial visit: to experiment with sonic and other raw material for the new piece, which will embrace artificial intelligence, electronic elements and a computer-generated text drawing on work of Jorge Luis Borges. Pauly “is an astonishing composer whose star is very ascendant at the moment,” Teodori said. He thought back to a 2017 performance of Pauly’s Charred Edifice Shining by the composer’s British-based new-music ensemble, Distractfold. “Those 25 minutes (seemed like) about 8 minutes due to the engrossing sound world and compositional mastery of Mauricio,” Teodori recalled.